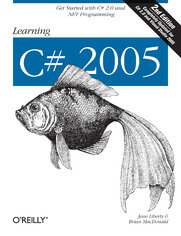 If you're a novice programmer and you want to learn C#, there aren't many books that will guide you. Most C# books are written for experienced C++ and Java programmers.That's why Jesse Liberty, author of the best-selling books Programming C# and Programming ASP.NET, has written an entry-level guide to C#. Written in a warm and friendly manner, Learning C# assumes no prior programming experience, and provides a thorough introduction to Microsoft's premier .NET language. The book helps you build a solid foundation in .NET, and shows you how to apply your skills through the use of dozens of tested examples. You'll learn about the syntax and structure of the C# language, including operators, classes and interfaces, structs, arrays, and strings. New coverage of generics, generic collections, partial classes, anonymous methods and more. By the time you've finished Learning C#, you'll be ready to move on to a more advanced programming guide that will help you create large-scale web and Windows applications. Whether you have a little object-oriented programming experience or you are new to programming altogether, Learning C# will set you firmly on your way to mastering the essentials of the C# language.